Hotel Hippodrome Montmartre kohteessa Pariisi, Ranska: Varaa nyt! In the heart of Montmartre just 100 metres from the Moulin Rouge, between Place Blanche and Place du Tertre, Hotel Hippodrome is located in a Parisien area made famous by painters and poets throughout the decades. 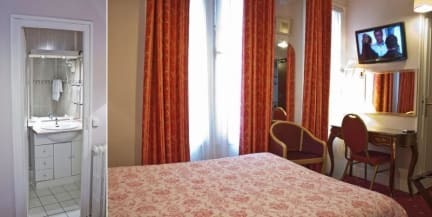 This hotel is on Boulevard de Clichy and is served by all public transport. From here you can reach the Champs Elysee, Opera and Gare St Lazare (one of the city's main train stations) very quickly with on the metro or the bus. You can also reach the Stade de France in 10 minutes and Charles de Gaulle airport in just 30 minutes. Stay in one of our single,twin or double rooms. 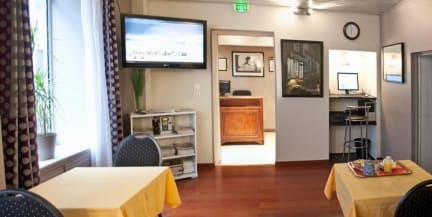 All our rooms are equipped with hairdryers,cable TV and telephone.